When it comes to commercial trampolines, there is no shape to fit them all. There are round, oval, square, and rectangular trampolines, so oftentimes buyers might get confused about which is the best for them and their family. In this post, we’ve analyzed the two most popular types of trampolines according to their shape: the round-shaped trampoline and the rectangle-shaped one. Check out each trampoline’s pros and cons and whom we recommend them for. The round trampoline is the go-to model, when a non-professional thinks about buying a trampoline for their backyard. Round is the most common shape in a trampoline and it is probably the first thing that pops in our mind when thinking about a trampoline. Because they offer a more controlled and less dangerously high bounce than their rectangular cousins, round trampolines are recommended for families with young kids or people new to trampolining. A round trampoline is safer for small kids because the center of gravity is located right in the middle, which means that the small jumpers will tend to be pulled back toward the center. Also, as they move farther away from the center and closer to the edge, bounces tend to get less intense, reducing kids’ risk of injuries. One of the biggest pluses of a round trampoline, though, is its price. Because they are more popular than rectangular ones and require less of a heavy-duty frame due to their compact design, round-shaped trampolines are the most cost-effective. 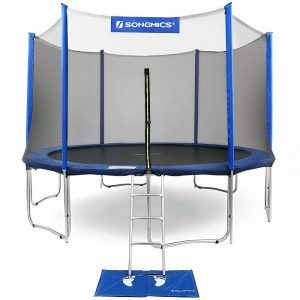 What’s more, they usually come in a wider variety of models and colors than rectangle trampolines. 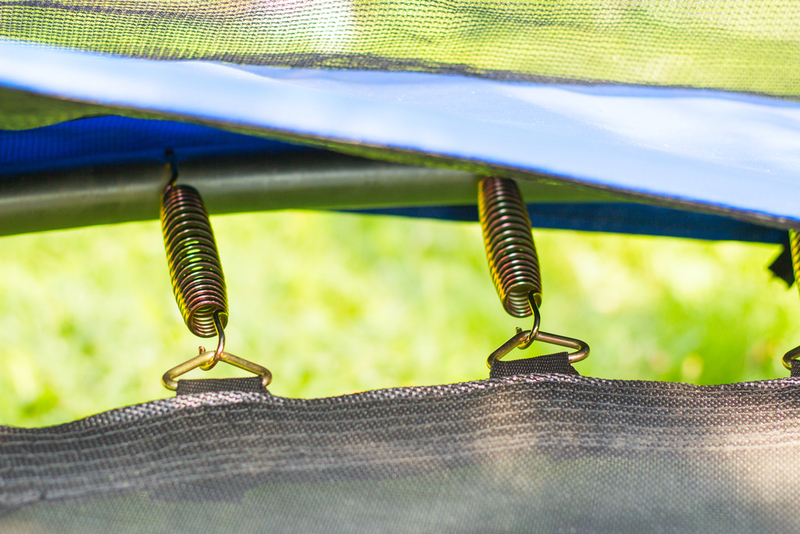 The two top drawbacks are their small size and uneven bounce, which places more stress on the trampoline’s springs. For teens and adults that are really into trampolining, a high-quality rectangular trampoline is the best choice. Small kids can use a rectangular trampoline too, but not without incidents if there is no adult supervision. However, we do not recommend this type of trampoline for small kids or teens under 13 because of its’ high bounce which can propel small jumpers off the jumping surface. This trampoline is usually best used by adult and/or experienced users. And because bounces can get a lot higher than on a round trampoline, the rectangle trampoline is perfect for gymnastic exercises and tricks like double flips and somersaults. Stunts are easier to pull off on a rectangle trampoline due to the larger jumping space and the trampoline surface’s even rebound. Since round trampolines come with an uneven rebound, tricks can be done only in the center and not without some risks. Rectangular trampolines are preferred by most professional and semi-professional parkour athletes, aerialists, and gymnasts because they have more control of their bounce than on a round trampoline. The bounce will have the same height and intensity from any point on the jumping surface as the trampoline’s springs work separately. Also, rectangular trampolines can be used by multiple jumpers at the same time because users will not be redirected toward the center as they would on a round trampoline. This makes it ideal for whole families. Unlike a round-shaped trampoline, the rectangular one comes with multiple landing sweet spots, which means that the load is evenly distributed across its surface and the weight limit is higher than in round trampolines. In addition, because rectangle trampolines are usually much larger than round trampolines, they require a sturdier frame. That’s why rectangle trampolines are usually made of quality materials as manufacturers cannot skimp on quality without compromising trampoline safety. If you’re on the fence about which type pf trampoline is best for you, here’s a quick buying guide to what to look for in a trampoline. You should pick the size of a trampoline based on who is going to use it. The smallest trampolines can be 7 ft. wide (round) while the largest can be 17 ft long. (rectangle). 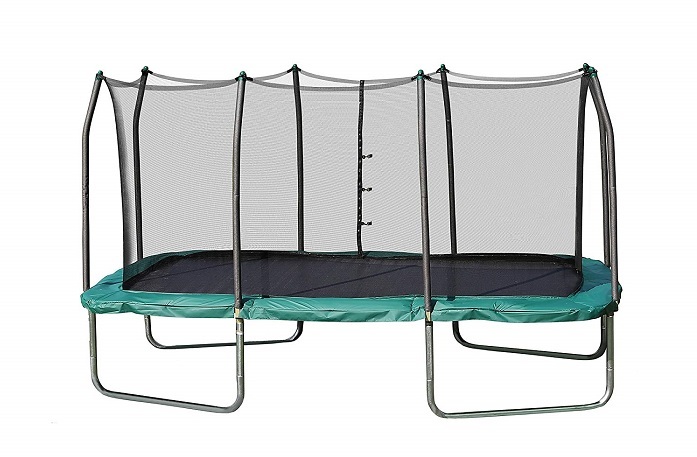 For small families and small jumpers, a 7 ft- 10 ft trampoline is all you need. For growing families and teenagers, go for a 17 ft rectangle trampoline or a 15 ft round trampoline. Also, bear in mind that the jumping surface is a bit smaller than the manufacturer’s measurements. Look for the jumping mat’s real measurements before you buy a trampoline. When looking for a good-quality frame in a trampoline, don’t just assume that a round trampoline’s frame is weaker. Indeed, most trampoline makers use cheaper materials for the construction of round trampolines because a circle is more compact and offers greater strength than a rectangle. However, more and more manufacturers are now using 2mm frames in round trampolines too to boost their durability. The quality of a trampoline will usually be reflected by its price. Galvanized steel comes with a silver finish; it is rust resistant and very durable; heavier-duty frameworks are usually made of it. Trampoline safety is a must especially if you have small kids. 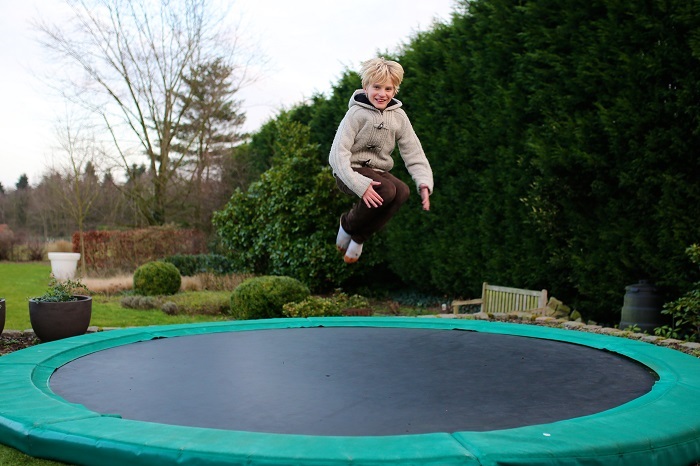 As we have mentioned earlier, the safest trampolines for young children are the round-shaped ones. Because round trampolines come with limited jump height and tendency to direct the jumper toward the center, children will not be able to jump too high around the edges and injure themselves. If it is possible, get a trampoline that has been certified by the ASTM (American Society for Testing and Materials). This group has a strict set of rules for trampolines to be considered kid-safe. Nevertheless, the rules are not mandatory for all trampoline suppliers. Nonetheless, only an ASTM-vetted trampoline will give you the piece of mind that the stated weight capacity has been approved through independent static load tests. For extra safety, get an enclosure net when buying the trampoline for kids or teens. Enclosure nets can reduce dramatically the risk of injury among inexperienced jumpers. According to official estimates, 1 out of 5 trampoline injuries are caused by jumpers falling off the trampoline. Trampoline enclosures prevent users from getting dangerously close to the edge. Also, use padding on the springs and frame to cover any dangerous gaps. Most trampolines come with a spring pad, but we recommend buying a thicker one separately if the original pad seems flimsy. 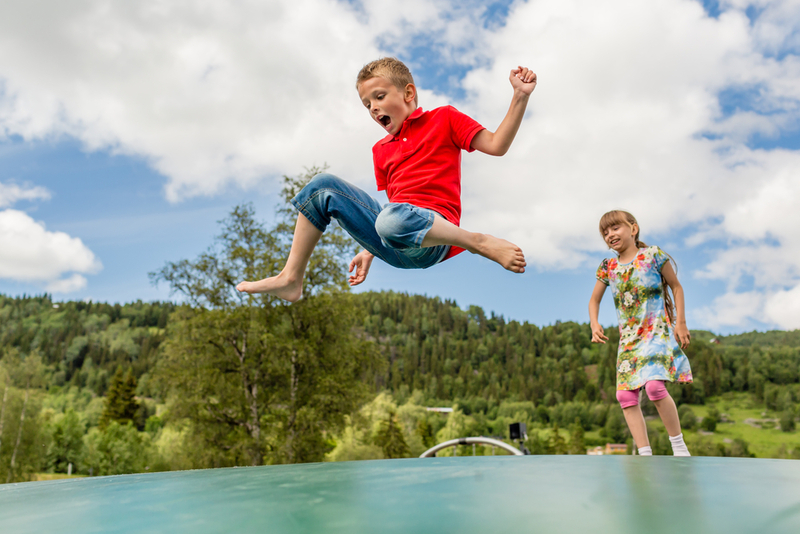 Click here for a comprehensive list of trampoline safety rules by the trauma and emergency experts at the Pittsburgh-based UPMC. Most round trampolines can usually hold up to 200-300 lbs. (90-135 kg), with the larger ones (14 ft to 16 ft wide) reaching a maximum weight limit of 250–400 pounds (113–181 kg). Rectangular trampolines, on the other hand, can hold up to 300–450 pounds (136–204 kg). As a rule of thumb, a trampoline should hold up to four times the stated weight capacity, according to ASTM standards. But once again, not all trampolines are ASTM-approved. If you are buying a trampoline for small kids or inexperienced users just for having some fun, pick a round trampoline. As jumpers grow and become more experienced, you can upgrade to a rectangular trampoline. The latter is also great for sports training and fun family activities.